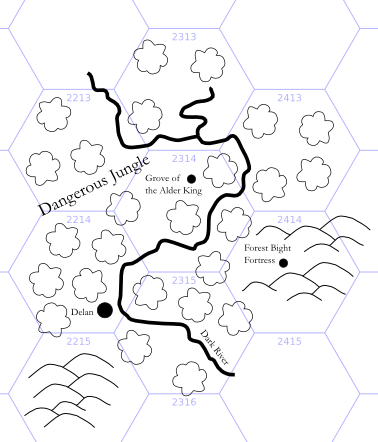 Zak thinks about hexcrawling and asks: do you just sort of write a few bits about each place and wing the details when the players get there, or what? Brian adds that most of his hexes are empty (about one in ten has interesting stuff). 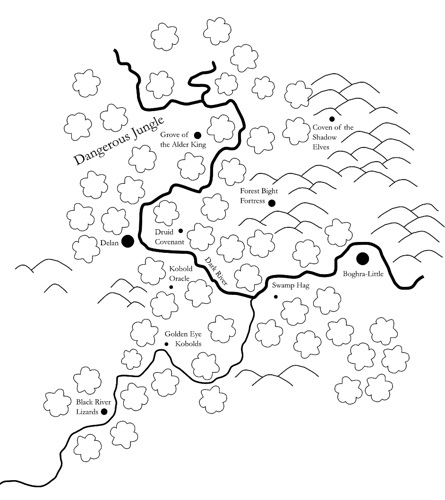 That density certainly looks similar to the Wilderlands of High Fantasy maps such as the Lenap map that I started with. As time passed and my players started to explore, the map started to grow. The current player map is even bigger, now. Make sure the hexes around the player’s current hex and any long range goals they want to pursue are on the map with at least a paragraph of notes for each. Grow the map if I feel like it. Add notes for hexes on the map that don’t have any. Add more notes to hexes in order to interlink the various locations. Also, How to make a Fantasy Sandbox by Rob Conley is the best advice on the topic I’ve seen. Hmmm. I feel a blogpost coming on! Hm, I faintly remember seeing something like that... A one-page sandbox campaign-maker for OD&D by Nicolas Dessaux aka. Snorri, via Sean Wills’ One-Page Sandbox Maker “one link, one line” blogpost. Nice post. I love the look of your large(r) scale hex map. Old School Hex Map Tutorial! I like the map a lot. Thanks for the link also.